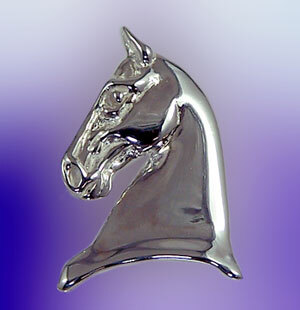 "Three Gaited Saddlebred Head Pendant in Sterling Silver"
Saddlebred Head Pendant. The Gorgeous Horse is your source for custom Saddlebred Jewelry. The details in the head make a great contrast with the smooth and shiney silver neck. This is a very comfortable piece very practical for everyday wear. Pictured here in sterling silver, you can always customize this peice, perhaps have it in 14kt solid white gold with a few diamonds across the bottom of the neck. If you ever have any requests or comments, use the request box below and we'll be glad to accommodate you. Dimensions: 7/8 inches wide x 1 1/4 inches tall. Available in 14kt yellow or white gold and sterling silver.